Dorel Industries Inc. (TSX:DII.B) (TSX:DII.A) announced on Friday [August 3rd] results for the second quarter and six months ended June 30, 2018. Second quarter revenue was US$623.2 million, up 2.0% from the same period a year ago. Reported net loss was US$14.8 million or US$0.46 per diluted share, compared to reported net income of US$11.4 million or US$0.35 per diluted share in the second quarter of 2017. Adjusted net income increased 1.7% to US$12.7 million or US$0.39 per diluted share, compared to US$12.4 million or US$0.38 per diluted share last year. Revenue for the six months was US$1.27 billion, an increase of 0.6% compared to US$1.26 billion last year. Reported net loss was US$10.0 million or US$0.31 per diluted share, compared to reported net income of US$20.3 million or US$0.62 per diluted share a year ago. Removing the impact of the first quarter impairment loss on trade accounts receivable from Toys"R"Us of US$9.4 million after tax, first half adjusted net income decreased to US$27.6 million or US$0.85 per diluted share, compared to US$35.1 million or US$1.08 per diluted share a year ago. "Across our segments, Dorel Sports rebounded strongly after a tough start to the year, posting solid adjusted results. Dorel Home continued to grow on-line sales and maintained its strong earnings performance. Dorel Juvenile had a disappointing quarter, principally due to a difficult system implementation in Europe that caused us to miss sales. This and the fact that our Chilean business is in the middle of its turnaround plan masked our outstanding performance in the U.S. We overcame the impact of the Toys"R"Us bankruptcy earlier in the year as Dorel Juvenile U.S. had its best year-over-year revenue growth quarter in 9 years. We are encouraged by the markets' reaction to our new bicycle and juvenile products. Sell-through has been good over the past few months and more new products are set to launch through the second half, providing optimism for the balance of the year. "In a move to strengthen our Board, last month Norm Steinberg was appointed as a new Director. He has a strong track record as a seasoned professional with extensive experience in M&A and in corporate governance, guiding public companies. This knowledge coupled with a proven strategic vision, leadership and legal acumen will complement our existing Board members and will serve all extremely well. We are delighted to have Norm with us," stated Dorel President & CEO, Martin Schwartz. Dorel Sports had a much better quarter than anticipated, surpassing the expectations indicated in the Company's first quarter results press release. Second quarter revenue increased US$15.5 million, or 7.4%, to US$224.5 million and by approximately 6.5% after removing the impact of varying foreign exchange rates year-over-year. Six month revenue increased US$8.1 million, or 1.9%, to US$431.2 million which is flat to prior year after removing the impact of varying foreign exchange rates year-over-year. The segment rebounded from a difficult start to the year with improved second quarter adjusted operating profit versus first quarter. Compared to prior year, second quarter revenue growth was over 10% at both Cycling Sports Group (CSG) and Caloi. CSG recorded growth in all key regions with good momentum from recent product launches. Caloi continued to grow on new product innovation and was further aided by a gradual improvement in the Brazilian economy. 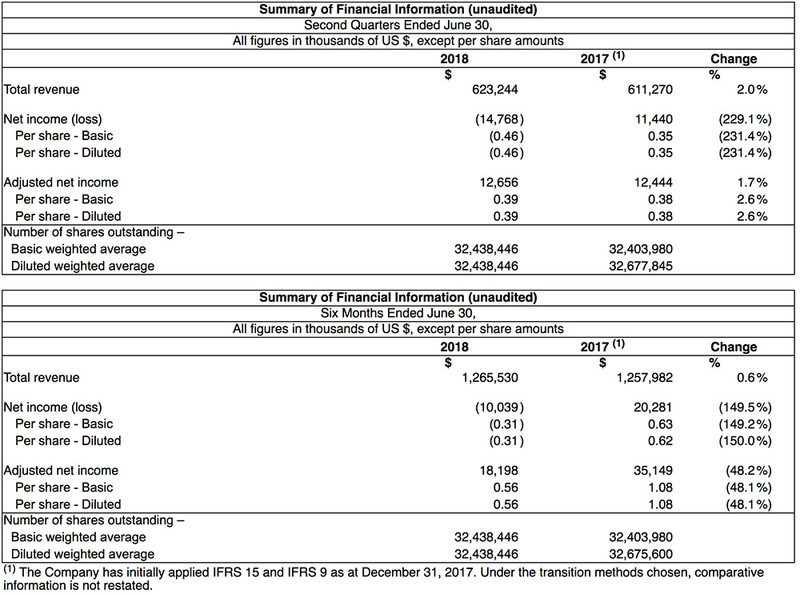 Pacific Cycle experienced a modest revenue decline overall with the negative impact of the Toys"R"Us U.S. liquidation, but revenue to other key customers increased. Second quarter operating loss was US$3.3 million compared to an operating profit of US$4.9 million a year ago due to restructuring costs mentioned above. Excluding restructuring and other costs, adjusted operating profit rose US$2.3 million, or 40.5%, to US$8.0 million from US$5.7 million last year. For the six months, operating loss was US$4.1 million compared to an operating profit of US$15.0 million in 2017. When excluding the US$6.6 million impairment loss on trade accounts receivable from Toys"R"Us U.S. recorded in the first quarter of 2018, adjusted operating profit for the six months was US$13.8 million compared to US$15.1 million a year ago which is mainly explained by the 70 basis points decrease in adjusted gross profit offset by higher revenue.